DALI Zensor 1 AX review | What Hi-Fi? A decade ago, the Dali Zensor 1 AX powered stereo speakers would have appealed to a tiny niche of hi-fi enthusiasts. However, it seems the time of the powered speaker may be here – at least, that’s what the Danish speaker manufacturer is hoping. And Dali might just be on to something – because the Zensor 1 AX is a good plan, well executed. With Smart devices now seemingly ubiquitous, vast tracts of the world’s population have grown used to carrying music on-the-go, and having a simple way of playing those tracks to a decent standard. Now, with this relatively small box and a smartphone in your pocket, you have all you need for musical entertainment. For those who want to listen to a decent stereo system from speakers that will offer immeasurably better sound than your flatscreen can possibly provide, it’s also a solution. And for anyone streaming BBC iPlayer, Netflix, Amazon Prime Video to their PC, this is a pair of speakers that will do justice to the incredibly detailed pictures. The Zensor 1 AXs are a pair of Zensor 1 speakers that will stand alone as a system, with just a source for company. Inside the left-channel speaker lies an amplifier that supplies the 2x 50W power to run both speakers. If you want to hard-wire a source in, there is a 3.5mm auxiliary input and an optical digital (Toslink) socket. For the streamers, there is Bluetooth, including the aptX codec for those sources that can take advantage of it. The speakers come with a power cord and speaker wire to connect to the right-hand speaker, and there’s a remote control to cover the major functions. The light on the front of the left-hand speaker shows which input is being used: green for the analogue input, orange for digital, blue for Bluetooth. 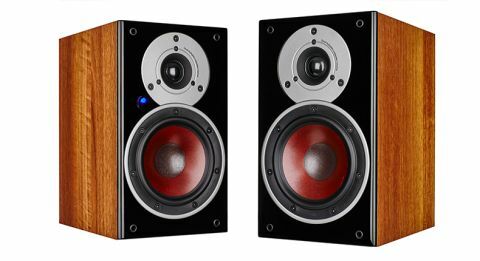 And that should be sufficient for most requirements – a traditional looking pair of speakers with a thoroughly modern purpose. As a traditional speaker, though, it should be placed on a solid speaker stand for best results. Certainly, if you’re planning on using these to boost your TV’s sound we’d look at something like the Atacama Moseco 6s at £120 or so. As the AXs are Zensor 1s with amplification added, it should come as little surprise that the sound is familiar Dali. What you get is a fast, tight, musical performance that makes your toes tap. We listen first via the 3.5mm input, and the sound is detailed and balanced, the soundstage impressively open. Treble and midrange are nicely articulated, with each instrument easily distinguishable, and vocals clear. Nothing stands out in the mix, which is as it should be. These are pretty diminutive boxes, so you shouldn’t be expecting anything huge in the way of bass production, but what you get is tight and accurate, and in keeping with the fun, sprightly nature of the sound. For more of a bass kick, however, there is a sub-out socket to connect to the subwoofer of your choice. Something to consider, perhaps, if you’re connecting your TV to the Zensor 1 AXs for some extra movie welly. Switching to streaming via Bluetooth brings a noticeable drop in sound quality, with the shortcomings of the streaming technology making things seem thinner and less substantial. The speakers are quite happy being placed close to a rear wall – indeed the bass can benefit from careful positioning. That also means that the Zensor 1 AXs can serve as PC speakers – although they are fairly substantial for such a purpose. They may be small hi-fi speakers, but hi-fi speakers they certainly are – so make sure you’ve got the desk space to accommodate them. Do the Zensor 1 AXs give better sound than the Zensor 1s connected to a stand-alone amplifier? No – a Marantz PM6005 for £300 will undoubtedly do a better job than the amplification housed in the AXs. But this little pair of powered speakers is certainly more convenient, and the sound they provide is more than enjoyable enough for us to be able to recommend them without hesitation. If their convenience suits your needs, you won’t go far wrong with the Zensor 1 AXs.